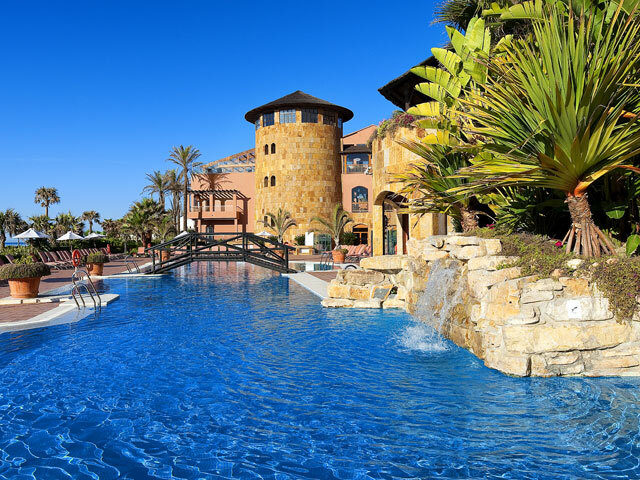 The Gran Hotel Elba Estepona & Thalasso Spa has been designed architecturally in a traditional style, with beautiful balconies all facing he beach, combined with a modern touch bringing the latest decorative and technological tendencies of every part of the hotel. Its best asset is theThalasso Spa, with more than 1400 m2 offering a wide range of healrh and beauty package deals, and also it's business area with a capacity of up to 300 people in the Eden Room. The Hotel is situated in the Arena Beach development, municipality of Estepona, right in front of the sea and only a few metres fom Estepona town centre. 138 Superior Double luxury rooms, of 37 m2, all with a private terrace or balcony of 8.5 m2 with magnificent sea view. 4 Junior Suites, decorated with a wealth of detail, of 55 m2, all with private errace or balcony of 19,7 m2 and magnificent sea views. 20 marvellous Suites located in the best parts of he building, provided with an individual lounge of 82.5 m2 which ensure total privacy, all with wide teraces of 16 m2 and unbeatable views, specially designed and elegantly decorated. They all offer spacious bathrooms and dressing rooms. Luxury Suites, of 150m2 which offer individual lounge area, two bedrooms and 2 bathrooms fully equipped, all with spacious teraces of 30 m2 and unbeatable views. Connection rooms, double bed rooms and non-smoking rooms are available, as well as rooms for disabled. 1 Adult's swimming pool and a separate kid's pool, both of fresh water, invite older and younger ones o freshen up, during the summer. 1 Winter indoor swimming pool. Golf Desk, for the organisation of meetings and golf events. With more than 5 golf courses all of them less than 40 km away by car, the hotel offers tailor-made golf packages for different game levels. On the first floor, there is a reading hall with a select library, offering books in several languages, where you can also enjoy board games. Shopping Area, located at the Lobby of the Hotel E-mail & Internet service. To start off the morning, a very elaborate and assorted buffet breakfast will be served at the "Arena Beach" restaurant at he open air erace, from where one can enjoy the excelent views of the Mediterranean sea and the gardens of the hotel. A delicious buffet of both cold and hot dishes, as well as a very select menu, invites you to enjoy a lunch of your choice. Restaurant a la carte "Paris - Roma"
A combination of Italo-french themed cuisine that will enable you to enjoy of the greatest gastronomy of both countries, together with the best wines of the area. Our Thalasso-spa clients can also enjoy special low calorie meals. Restaurant a la carte "Al Andaluz" Restaurant a la carte "Al Andaluz"
In a typical Spanish environment, you will be able to enjoy typical Spanish high cuisine, served with a wide selection of national wines. Those clients who choose Half Board will enjoy of an elaborate and assored 4course meal. Restaurant a la carte "Asia Fusion"
Offering a wide choice of Asian style dishes, from India to Japan, and passing through the rest of the countries of this great continent. The meeting place at night-time, where you can enjoy some snacks while you are mesmerized by the professional live shows and music. A place to enjoy exquisite cocktails, with views to he sea.